The mountains and foothills of Western North Carolina are world-renowned for their living traditions of old-time and bluegrass music. 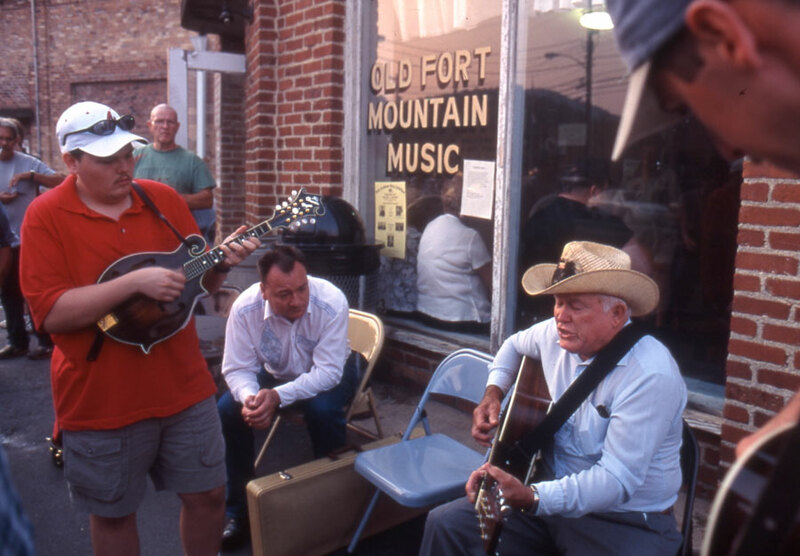 In 2003, this vibrant music heritage spurred the launch of the Blue Ridge Music Trails as a tool for heritage tourism development and helped earn the region a Congressional designation as the Blue Ridge National Heritage Area. While traditional music is but one part of all the music activity in Western North Carolina, it is of interest here because it remains a cornerstone of the region's cultural identity. Few places have had more influence on the development of the banjo in America. Musicians from the Western Piedmont and Mountain region – including Earl Scruggs, Charlie Poole, and Snuffy Jenkins, among many – are recognized as the creators and popularizers of modern banjo styles. Clogging in Western North Carolina is recognized as among the most highly-developed vernacular dance traditions in the country. Haywood County is the birthplace of team square dancing, which first originated there in the 1930s. One of the longest unbroken ballad-singing traditions in America is found in Madison County, where English folk-song collector Cecil Sharp first documented singers prior to World War I. The Mountain Dance and Folk Festival, started in Asheville by Bascom Lamar Lunsford in 1928, is the oldest continuous folk festival in the United States and is the model for the National Folk Festival. Twelve ballad singers, old-time fiddlers, and banjo players from Western North Carolina have received the nation’s greatest honor in the traditional arts – the National Heritage Fellowship awarded by the National Endowment for the Arts. The combined number of North Carolina recipients for these musical genres exceeds that of any other state in the nation. The number of venues and recurring events – music halls, jamborees, festivals, fiddlers’ conventions, concert series, jam sessions, and the like – dedicated to presenting traditional music and dance in Western North Carolina is remarkable. A conservative count in 2011 put this number at 160*. That same year, visitor research conducted at 26 of these venues and events revealed a direct economic impact of $18.6 million and a total economic impact of $20.7 million, when factoring in indirect and induced impacts. Nearly 40 percent of visitors surveyed at these sites said that the primary purpose of their trip to the area was specifically to attend the music event at which they were surveyed. Over 99 percent of surveyed visitors stated that they intended to return to the same event the following year, indicating a very high level of customer satisfaction. A typical community event of this type can be expected to return more than $4,000 for every 100 visitors attending. In Western North Carolina, old-time and bluegrass music continue to be passed from generation to generation as living traditions. 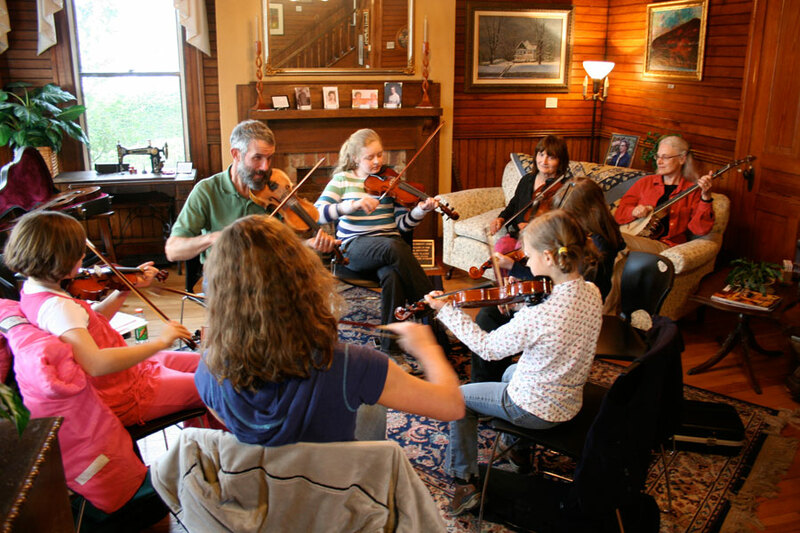 While these music traditions have always been handed down informally within families and communities, a more recent development is the establishment of after-school programs that provide kids with more formal opportunities to learn traditional music from musicians in their community. The first of such programs was launched in Alleghany County in 2000 by guidance counselor and musician Helen White. Known as Junior Appalachian Musicians (JAM), the program was so successful that arts organizations and school systems in many Western North Carolina counties sought to establish their own programs. The North Carolina Arts Council and Blue Ridge National Heritage Area have provided funding to support these efforts. The North Carolina Arts Council administered the 2011-2012 JAM programs, and other statewide after-school traditional arts programs, under the rubric Traditional Arts Programs for Students (TAPS). In the 2011-2012 school year, JAM programs were operating in 12 Western North Carolina counties, serving a total of 581 students, engaging 52 instructors, and reaching over 8,400 audience members through showcase events and performances. While it is not practical to count the number of young traditional musicians across the region, the numbers of these after-school programs and students served by them are reasonable indicators of efforts within communities to cultivate and encourage the next generation of old-time and bluegrass musicians. * These venues and recurring events have a primary focus on the presentation of old-time and/or bluegrass music, or have dedicated a significant proportion of their programming to such music. Also included are shape-note and gospel singing events that occur at least annually and that invite public participation. 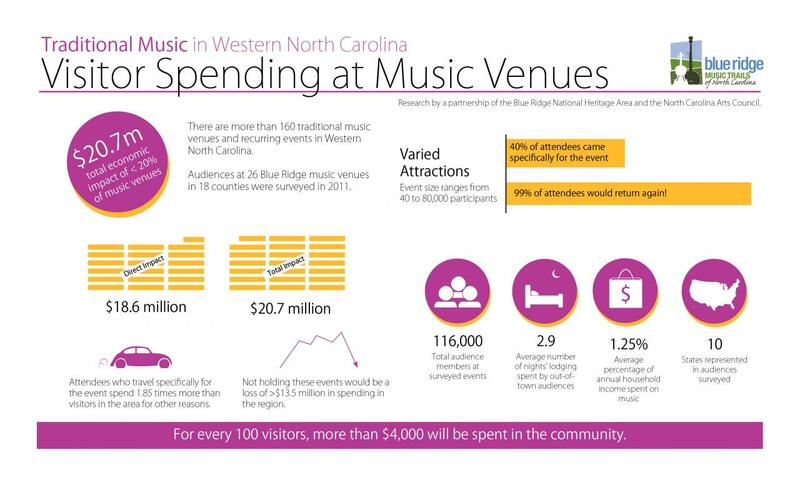 Public venue and event data were adapted by the Blue Ridge National Heritage Area Partnership from the Blue Ridge Music Trails website, which was produced by the North Carolina Arts Council and the Blue Ridge Institute & Museum of Ferrum College. Accessed from: http://www.blueridgemusic.org/. Youth engagement data courtesy of the North Carolina Arts Council. NCAC Traditional Arts Programs for Students (TAPS and JAM). Accessed from: http://www.ncarts.org/freeform_scrn_template.cfm?ffscrn_id=73. North Carolina Arts Council, 2012. Creative Industry Analysis: Traditional Music Venues in the Blue Ridge Region of North Carolina.